Oh Conrad we love you!" That little ditty has been stuck in my head since seeing Bye Bye Birdie at the Chanhassen* last night. This is the first time this classical musical from the 1960s has played on the Chanhassen stage, and the first time I've seen it. In fact, I really only knew of it from that episode of Mad Men where Peggy imitates Ann-Margaret singing the title song of the movie, trying to live up to the early 60s ideal of womanhood (in that brilliant way Mad Men has of breaking down the social mores of the time, that aren't as different as we think from today). So the show was all new to me, and I really enjoyed it. 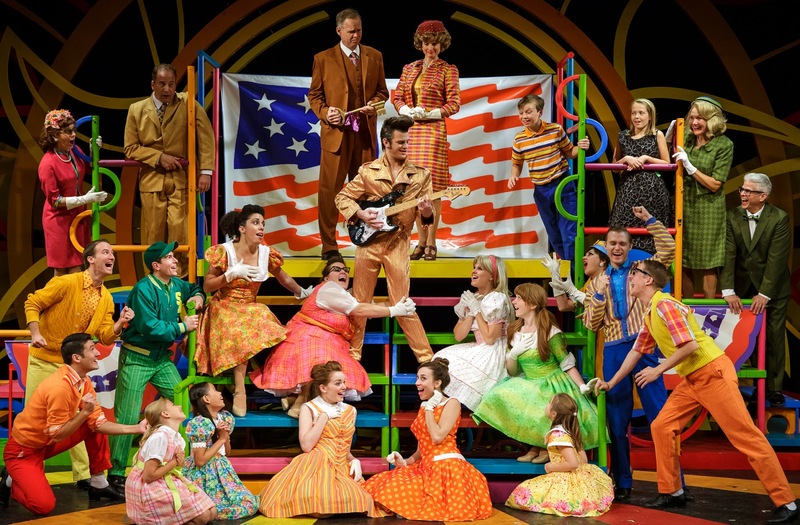 It's a big, old-fashioned, fun musical with a huge cast and fantastic dance numbers. There's nothing deep about it, but it's highly entertaining. For those of you who, like me, are unfamiliar with the story, Bye Bye Birdie is about an Elvis-like singer named Conrad Birdie (Frank Moran with a brilliantly high pompadour and a suitable charismatic nonchalance) who is drafted into the Army. His agent, Albert (a charming Michael Gruber), and secretary/ girlfriend, Rose (Ann Michels in a feisty performance that includes a pretty spectacular dance number), come up with a publicity stunt in which Conrad kisses one lucky fan chosen at random to promote the release of the song "One Last Kiss," before shipping out overseas. That lucky fan is Kim (the sweet-voiced Jessica Fredrickson) of Sweet Apple Ohio, who was recently "pinned" by her boyfriend Hugo (my new fave Tyler Michaels, who gets to show off his unique physical style of acting in a drunken scene). Conrad and company arrive in the small town and cause a hubbub. Turns out Conrad's not the innocent all-American boy he seems to be, preferring to drink, dance, and party. Hugo is jealous of Conrad, and Rose is jealous of Albert's new secretary (Xanadu's Jodi Carmeli in a small but memorable role), so they both scheme to prevent the kiss. Which, by the way, was to take place live on The Ed Sullivan Show! Both of our couples are on the outs as the second act begins, and there's a wild night of partying at the Ice House ("what's there?" "I don't know, ice?"). But of course, since this is a traditional musical, both couples find their way back to each other by the final curtain. This is a huge cast full of many Chanhassen faves and a few newcomers, all of whom are entertaining and fun to watch. 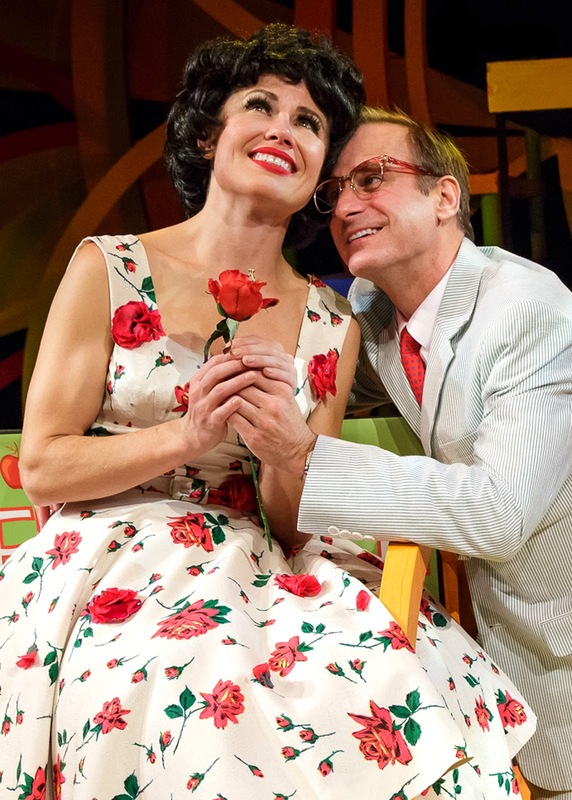 Standouts, in addition to the ones mentioned above, are Seri Johnson as Albert's long-suffering martyr of a mother (or at least that's how she sees herself), Keith Rice and Michelle Barber as Kim's strict but loving parents, and Tod Petersen as the fawning mayor. The teen girl chorus is particularly fabulous (Hairspray's Therese Walth, Emily Madigan, Caroline Innerbichler, Ruthanne Heyward, and Larissa Gritti) as they swoon over Conrad, dance, and sing the aforementioned little ditty. 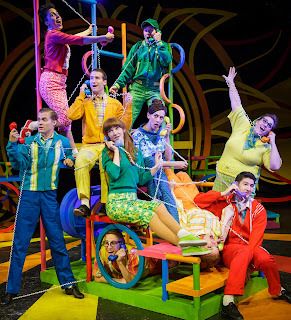 The group dance numbers are energetic and bouncy in that 50s style, especially "The Telephone Hour," "Honestly Sincere" (in which the entire town, including the mayor's wife, ends up at Conrad's feet), and "A Lot of Livin' to Do." The score also includes a couple of familiar songs "Put on a Happy Face" and "Kids" (I don't know what's wrong with these kids today). It's no secret that I loved the Chanhassen's summer musical Xanadu, which was a bit of a departure for them in that it's a new musical with a smaller cast and a little bit of a wicked, sarcastic tone (which is probably why I loved it). But with Bye Bye Birdie they return to their standard (which is not a bad thing) - a classic musical with a huge cast and fun musical numbers. Playing now through March 30, it'll make your winter a little warmer and brighter. *I received two complementary tickets to the Opening Night of Bye Bye Birdie.